The entry list is up and Robby Gordon is listed as start position seven. Now I started this discussion to just get some ideas and predictions before the race. I'll kick it off by noting that the race course is the same as last year. Considering this, the teams that ran the race last year are going to have an advantage. It's not like Robby has never ran there before and that he has no chance. I think he has a great chance and and I hope he does well (I mean if he does well, then I get to see him at Primm). I just thought that might be a little food for thought. Let's continue to lead after SF..
Let's have 1996 Championship repeat except for a Baja 1000 win at the end too. Do we know if JustinTv will have footage or feed from San Felipe? Spoke with SurfRat, he is the one that had live feeds from Laughlin and others, he will not be broadcasting from San Felipe. No internet connection there for him. They are doing tire testing again and a shakedown; running new 39'' tires this weekend. 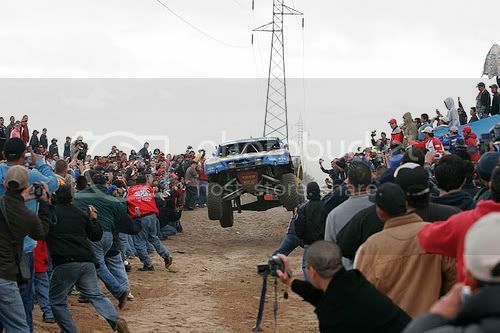 just a few days more for San Felipe i cannot wait for that race is 1st one haha! !